● Dangerous wild parsnip infestation along some bicycle paths. The sap from wild parsnip plants can cause serious and painful skin blisters, the consequence of which can sometimes last for years. Ottawa is currently in the midst of a wild parsnip infestation, and heavy concentrations of the plant can be found next to bicycle pathways in a some areas. This may not be of great concern for many cyclists because the plant is found only in a few areas mainly in the outskirts of town, and there shouldn’t be too much danger as long as people stay on the pathways. However, anyone who wanders off the pathway into a patch of wild parsnip can be in real trouble. If the sap from a broken leaf or stem of the plant gets on your skin and is exposed to sunlight (even on an overcast day), you can expect some serious blisters and a painful burning sensation. Making matters worst is that in some cases, a rash can appear years later every time the affected area of skin is exposed to sunlight. 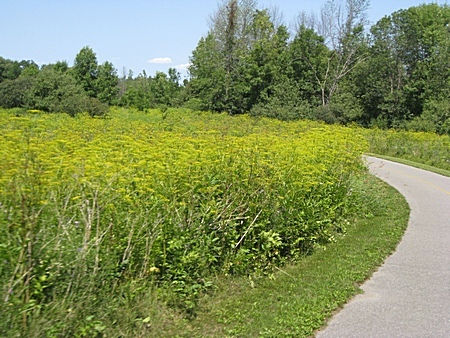 The photo below shows a field that’s absolutely inundated by wild parsnip (the plants with the yellowish tops) right next a to a pathway in the greenbelt in Ottawa’s west-end (the Watts Creek Pathway between Moodie and March Road). Wild parsnip next to the Watts Creek Pathway. You’ll notice from the photo that the bush and plants are cut back a foot or two from the pathway, so cyclists shouldn’t come in direct contact with wild parsnip. Nevertheless, I have seen at least one instance where a wild parsnip plant (which can grow over 4 feet tall) was leaning right into the pathway. It is also worth noting that wild parsnip is also starting to show up in large numbers along a lot of country roads around Ottawa. If you do get any of its sap on you, it seems the best advice is to immediately wash it off with soap and water, and protect the affected area of skin from sunlight for a couple of days. Unfortunately, this is easier said than done when out for a bike ride, so it appears that prevention is the best cure. In other words, keep your eye out for this plant whenever you wander off the pathway or road, especially when outside of Ottawa’s urban area. A CBC story (with video) from last year that provides a good indication of what can be expected from exposure to wild parsnip in a worst case scenario.